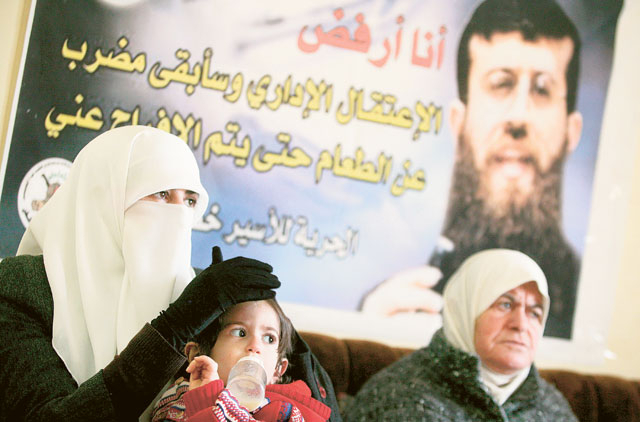 Ramallah: Palestinian prisoner Khader Adnan, who Tuesday ended a 66-day hunger strike, has become a potent symbol of protest against Israel's practice of holding suspects without trial. The 33-year-old prisoner, a political activist with Islamic Jihad who was arrested by Israel on December 17 and began refusing food a day later, has a long history of using hunger strikes as a protest. As his landmark protest stretched beyond nine weeks, doctors warned his high-profile attempt to challenge the Israeli army's justice system could cost him dearly. But yesterday, his hunger strike, easily the longest ever staged by a Palestinian prisoner, drew to a close after officials in Ramallah and occupied Jerusalem reached a deal which will see him released on April 17, exactly four months after his arrest. His protest put the spotlight squarely on a military procedure dating back to the British Mandate known as administrative detention, under which a suspect can be held without charge for six-month periods, renewable indefinitely. Israel's Supreme Court had been expected to hear an appeal by Adnan's lawyer Tuesday, but the hearing was cancelled after news of the deal became public. A baker by trade, from the village of Arabeh near the northern West Bank town of Jenin, Adnan is no stranger to hunger striking as a form of protest. Born on March 24, 1978, he became politically active on behalf of the radical Islamic Jihad movement in 1996 while studying for a degree in mathematics at Birzeit University near Ramallah. He was first arrested by Israel in March 1999 and spent four months in administrative detention. Eight months later, he was arrested by the Palestinian National Authority (PNA) for encouraging his fellow students to throw stones at visiting French prime minister Lionel Jospin, sparking his first ten-day hunger strike. In December 2002, he spent a year in administrative detention, and six months after his release, he was arrested again and placed in solitary confinement. In protest, he went on hunger strike for 28 days until the Israel Prisons Service relented and put him back in with the general population. He was arrested again in August 2005 for a 15-month period, and then in March 2008, he served six months of administrative detention. 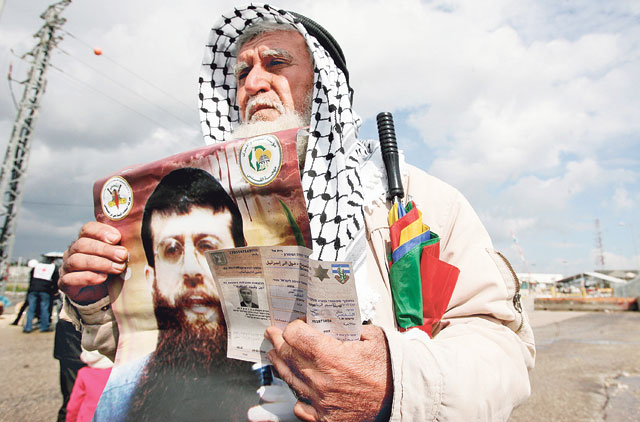 Adnan has served as a spokesman for Islamic Jihad since 2000, and in October 2010, he was arrested by the Palestinian security forces in connection with his political activity. Adnan's latest protest has seen him break the record for the longest hunger strike by a Palestinian prisoner, with the previous record set in 1976 when a group of prisoners refused food for 45 days. Married for seven years, Adnan has two small daughters, Ma'ali, four and 18-month-old Bisan. His wife, Randa, is five months pregnant with a baby boy. Speaking on Monday, his wife described him as a determined man with very strong principles who would "stick to his message, even if he has to sacrifice his life."